Today I'm starting this new thing in my blog called 'The Beauty Five' where I'll be talking/reviewing five things, it can be similar products, five products from the same brand or just five random things I like... you get the idea. I thought this could be a better way to talk about many products without having to review each one of them in different posts or having to write way too much. 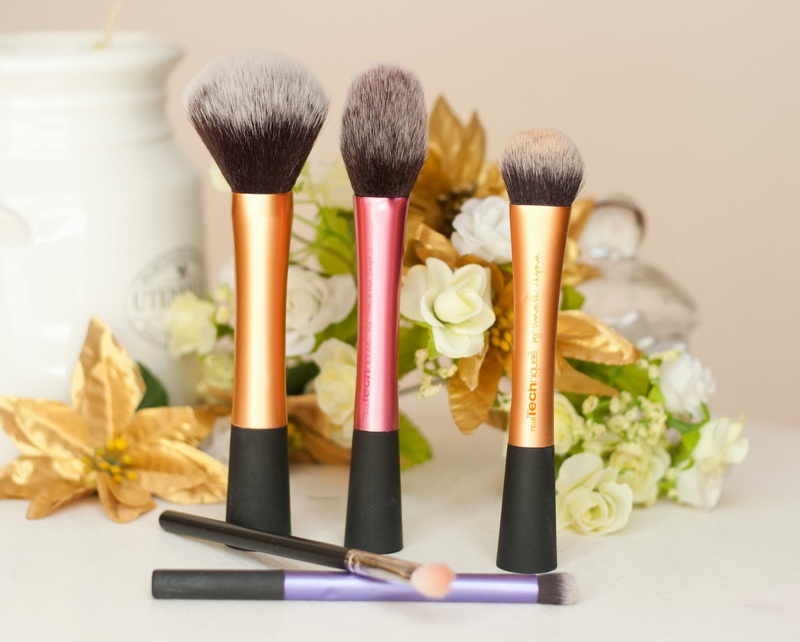 And I wanted to start these series with my five favorite make up brushes, the ones I use every single day and that I will be using until they day they break, and possibly repurchase. I'll start off by talking about the Real Tecniques brushes, everybody knows them. Made with extremely soft synthetic hair, a very modern design and great quality, these brushes are a great deal for everybody. When I started studying to be a Makeup Artist I was told that I'll need to invest in high quality brushes and now I honestly think that some of the Real Technique brushes are way better than other more expensive options, specially all the Face brushes such as the Powder Brush, Blush Brush, and Expert Face Brush. I own the eyes set too but I don't think they are amazing. The Blush Brush is my favorite, it has an oval shape and it feels so soft and gentle on the cheeks. I also use it to apply bronzer but if your face is too tiny you may wanna pass that. The Powder Brush is absolutely huge, very fluffy and I personally think it's way softer than Mac 150 (powder brush). My current favorite foundation brush is the Expert Face Brush. It has short bristles and looks thicker and tighter than the others. When I got it I was like.. gosh, this is so small! And now I'm glad it is, it gets in all the small areas leaving a flawless finish. Another brush I love is the Deluxe Crease Brush, this one comes in the Eyes Starter Set. However, it doesn't work well on my eyes, it's too thick and big to blend my eyeshadow properly. For that reason I think it's excellent as a concealer brush, specially when I use heavy concealers like the Mac Studio Finish Concealer or the Laura Mercier Secret Camouflage. I'd say this is a mini size the Expert Face Brush. Last but not least it's my Mac 217, the best brush I've ever known. It does all the job, literally changed the way I do make up. Works great with powder eyeshadow, cream eyeshadow, concealer, blends beautifully. Simply perfect. 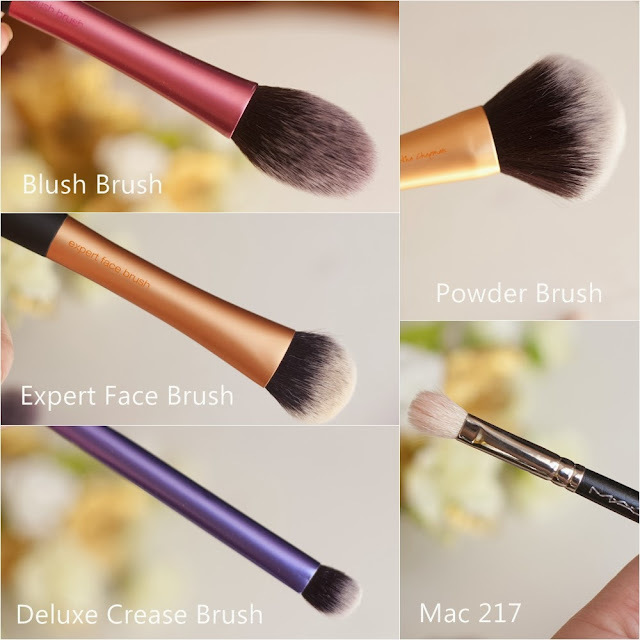 Do you own any of these brushes? If you could have only one brush for the rest of your life which one would it be? Hoy estoy empezando esta nueva serie 'The Beauty Five' donde voy a hablar de cinco productos similares, o cinco de una misma marca, o simplemente cinco cosas que me gusten... ya entendieron la idea. Como muchas saben, las brochas de Real Techniques se han vuelto muy populares últimamente. Hechas con pelo sintético extremadamente suave, un moderno diseño y muy buena calidad, estas brochas son las más vistas en el mundo blogger y Youtuber. Cuando empecé a estudiar Maquillaje me dijeron que iba a tener que invertir en brochas de buena calidad, y la verdad que la mayoría son caras... Mac, Bobbi Brown, Suqqu, al menos las que me gustan a mí cuestan arriba de los 20/30 dólares cada una (!). En cambio, las brochas de Real Techniques cuestan alrededor de 20 dólares el set con 4/5 brochas o 9 dólares las brochas que vienen individuales tipo la Blush Brush, Expert Face Brush y Powder Brush. Gran diferencia. 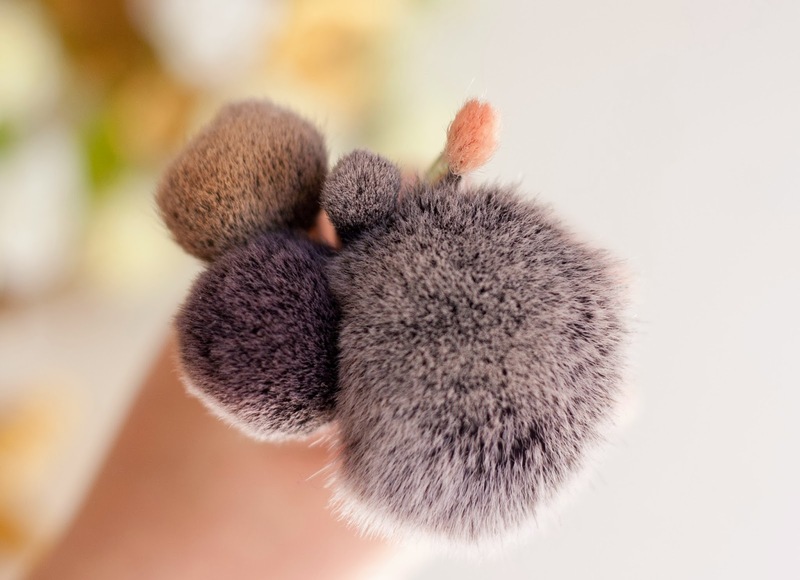 La Blush Brush (brocha de rubor) tiene una forma ovalada y es muy suavecita para las mejillas. También puede ser usada con el bronzer si es que no tenés la cara demasiado pequeña. La Powder Brush (brocha de polvos) es muy grande y mega mega suave, tengo una de Mac que me costó mucho más cara y sin embargo pienso que esta de Real Tecniques es mucho mejor. Mi brocha preferida de base actualmente es la Expert Face Brush. Tiene pelos cortos y más apretaditos que las otras. Cuando la vi por primera vez dije 'malísimo, es muy chiquita para mi cara' y hoy me alegro que así sea, cubre todas las zonas de mi cara muy bien dejando un acabado perfecto. Otra brocha que me encanta es la Deluxe Crease Brush, esta viene en el Eyes Starter Set y está pensada para difuminar la sombra pero la encuentro demasiado grande y tupida para eso. En cambio, la uso para el corrector de ojeras que tiene una consistencia más pesada. Esta es como una mini versión de la Expert Face Brush. Última y probablemente la mejor, la Mac 217, la mejor brochita que conozco. Excelente para sombras en polvo, crema, corrector de ojeras, difuminar. Es perfecta. Conocen estas brochas? Cuáles son sus brochas favoritas? I love the look/sound of the blush brush, definitely the next on my list ! Great post! I love the Real Techniques brushes too! Me encantan las brochas de Real Techniques. You have choose the same brushes as I would :)! The RT brushes are a must in my everyday make-up routine :). I wish you can get the R.T crease brush by itself, I love that brush !!!! Me compré el expert face de RT en un rapto de consumismo, me llegó junto con el stippling y el de rubor. Usé mucho tiempo la stippling para la base, un día no llegó a secarse y terminé usando el expert face. AMO. Al 217 le tengo unas ganas bárbaras, sólo tengo que decidirme a desembolsar la plata. Nunca las había visto en detalle, tienen forma rara, me gustaría tener las de ojos! This is a great idea! Thanks for sharing! Can you link up to where we can purchase these brushes? You can get them in iherb.com! las brochas real techniques me sacan suspiros, lo juro, son increibles! besitos, flo! El 217 fue el primer pincel de mac que compré y lo amo. De Real Techniques todavía no tengo nada, pero seguramente ya incursionaré. Tengo pendiente probar las brochas de Real Techniques. La 217 de MAC es un basico! Son muy populares las Real Techniques y tienen las mejores criticas... Cuando renueve el brochero tal vez incluya algunas. Se ven super suaves! Amazing picks! I used the RT Blush Brush for everything (powder, blush, bronzer) and I've been dying to try the 217 for ages! I love RT brushes!!! They are so soft and works so well. I have quite a few of them but I don't own the blush brush & expert face brush. Still need to get myself a #217! I've been putting it off because it's basically the same price as a whole Real Techniques brush set, so I don't know if I can justify it despite reading years of rave reviews. I adore RT brushes though - definitely can't do my makeup without them. Great post, I really enjoyed reading it and look forward to reading more in the series! I need to get a MAC #217.. It's been on my wish list for ages! I love all of these brushes! I just got the expert face brush and it is so soft! I like using the deluxe crease brush for concealer as well, I also using the setting brush for concealer and it works really nicely! OMY FLO! It's like I wrote this entry!! :) I pick the exact same brushes except substituting the Deluxe Crease Brush for MAC 239! I love the RT picks - my cant-be-withouts as well!! Soul sisters much! Love these too!just got them for Christmas and I'm in love! Happy to be your newest follower!